ALARM stands for Air-Launched Anti Radiation Missile and this type was introduced into RAF Service in the early 1990s. The missile is launched at low level near the suspected site of an enemy radar and, after launch, rapidly climbs to about 12,000 m.
At this height, a small parachute opens and the missile descends earthwards while the on board radar searches the broadband for emissions from enemy radar. Once a target has been identified, the motor is re ignited and the missile makes a supersonic dive onto the target. 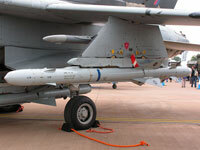 The total RAF buy in the first manufacturing run was believed to be some 750 missiles. Since its original entry into service, radars have become increasingly more sophisticated in their ability to avoid detection and attack by anti-radiation weapons such as ALARM. As a result, the missile has been upgraded and its capability improved. ALARM was used extensively during the 2003 Iraq War (Operation Telic) and the 2011 Libyan campaign Operation Ellamy. The missile is expected to remain in service until at least 2020. The Advanced Air-launched Anti-Armour Weapon (AAAW), known as Brimstone, is an area weapon to attack enemy armoured forces as early and as far forward as possible. It replaces the BL755 cluster bomb in the anti-armour role, and will be carried by Tornado GR4/4A, and the Eurofighter Typhoon. These fixed-wing aircraft will complement the capability provided by the Apache AH64-D, which is armed with the Hellfire anti-armour weapon. 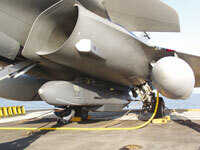 Brimstone operates automatically after launch, which helps reduce the hazard to the attacking aircraft from enemy fire. Development and procurement of Brimstone has cost the RAF some £822m since 1996.The weapon entered RAF service in mid 2005. In 2007 an Urgent Operational Requirement (UOR) for a precision guide missile for use in Afghanistan resulted in an upgrade to the Brimstone guidance system. This upgraded version is known as the Dual Mode Seeker Brimstone. It is believed that 300 of the older Brimstones missiles were upgraded to Dual Mode Seeker Brimstone standard and some sources state that about 500 have been delivered. During Operation Ellamy (Libya 2011) UK forces launched a total of 230 Dual Mode Seeker Brimstone. Each missile costs approximately £100,000 (excluding development and support costs). Storm Shadow (also known as Conventionally-Armed Stand-Off Missile or CASOM) is a long-range, air-launched, stand-off attack missile that will allow the RAF to attack high-priority targets deep inside enemy territory without exposing the launch aircraft to high-intensity enemy air defences. The missile is the BAe version (with some UK enhancements) of the French Matra APACHE/SCALP missile and entered service in late 2002. It is fitted to Tornado GR4 and the Typhoon (integration ongoing).. The RAF is believed to have purchased an initial batch of 500 missiles. The programme cost is some £980m. Storm Shadow was deployed operationally and fired with tremendous success during the 2003 Iraq War. Although the exact figure for Storm Shadow launched during Operation Ellamy (Libya 2011) is not known, MoD sources state UK forces employed a combined total of around 80 Storm Shadow and Tomahawk land attack missiles. Guidance Navigation using (TERrain PROfile Matching) system as well as GPS, Terminal guidance using imaging infra-red sensor, Autonomous target recognition algorithms, BROACH warhead.